If rumors were products, Cupertino would already own your living room and the 200mpg car in your garage would have a bitten Apple logo hood ornament. 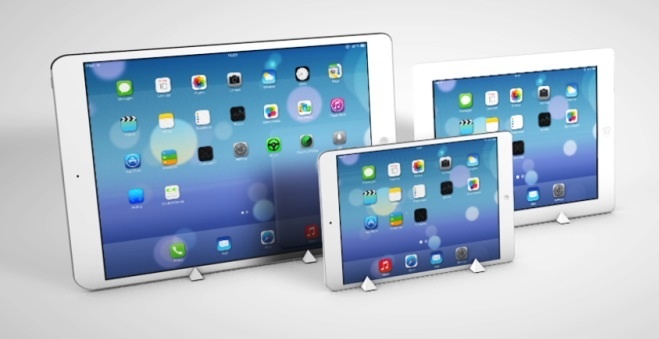 With that in mind, come fresh rumors that the mothership will launch 2K and 4K iPad Pro models in 2014.
International Business Times, a rumor ghetto on par with DigiTimes, is reporting that Apple will launch not one, but two 12.9-inch tablets. A 2K iPad is said to be coming in April 2014 while we can pencil in a 4K iPad for Apple’s traditional October tablet release timeline. Although the Korea Times doesn’t specify which partner, Apple currently sources tablet panels from Sharp, LG and Samsung — the latter two companies are based in Korea. For what it is worth, Cupertino’s current iPad Air features a 2K (2048 x 1536 with 264ppi) resolution display. Assuming Apple does ship a 12.9-inch iPad Pro with a 2K display, it would deliver a significantly less than Retina quality pixel density. Seem silly? Consider that Apple still sells the non-Retina iPad 2 and non-Retina original iPad mini. Such a large 12.9-inch iPad Pro might be priced and more appropriate, like Apple’s other non-Retina slabs, for education. Naturally, a 4K iPad Pro would be the Cadillac of Apple’s tablet product lines and be targeted at the art, engineering and architecture verticals. That said, how much would a 2K or 4K iPad Pro sell for? Given the that 7.9-inch iPad mini sells for $399 and 9.7-inch iPad Air for $499, shouldn’t the 12.9-inch iPad Pro go for $599?